Welcome to Our Open digital Classroom! ﻿Welcome to Our Site! ﻿ This course website focuses on DIGITAL RHETORICS. ​If you look at the slideshow to the left, you will see the various projects we will undertake as well as student website projects for inspiration and models. This course is about DIGITAL JUSTICE: the justice issue that moves you most right here and right now, the ways the issue lives and moves people via digital tools, and the digital footprint that you yourself will leave behind for that movement. How do digital technologies impact the ways we write, conceptualize, and disseminate ideas? What are the techniques of print culture that we borrow from, amend, or completely alter in digital spaces? What’s new? What’s "old"? How are 21st century audiences impacted and to what ends? What are the identities, practices, and strategies of persuasive techniques in digital contexts? Though new technologies will drive the focus of this class, remember that technology can’t do ev’rythang. Technology does not RUN YOU! You run it! It is created and sustained by us to better fulfill some of our needs and goals. So, no, the technologies that we work with in this class won’t be able to capture all of the depth of our image, sound, thought, vision, and desire, but we can certainly work to bring it a little closer to us! In December 2013, J. Elizabeth Clark, a fellow CUNYite, gave a wonderful presentation called “Digital Todays, Digital Tomorrows” at John Jay College. She shared her avid pursuit of scuba diving and then made a bold comparison to schooling, particularly criticizing the ways that writing is currently taught. 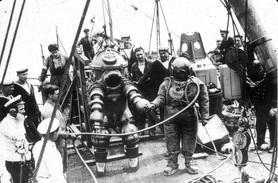 Clark began by showing images of scuba diving equipment from previous decades, highlighting the ways that new technologies have transformed the experiences of and possibilities for diving. By the 1970s, the buoyancy control devices, pressure gauges, and single hose regulators performed very differently and became the norm, alongside dive computers in the 1980s. While, of course, diving gear from the early 1900s would certainly still work, Clark insisted, rightly so, that she is not inclined to use that gear for diving. In fact, scuba diving has a fascinating history and with each technological advancement, its training has also changed This is not to say that diving is a totally altered experience from its centuries-old beginnings. However, its contemporary technological changes and new iterations have changed what divers do today. It’s unthinkable to imagine otherwise. Clark asked us why so many writing teachers and writing classrooms insist on discarding new technologies in ways that divers, for instance, never would. It would be like diving into a reef in 2014 with 1914 equipment. It’s a compelling argument, one that we will take seriously in this class.